The most famous glass recipe in Antonio Neri’s 1612 book, L'Arte Vetraria, is “#129 Transparent Red.” The reason for its notoriety is, of course, the pure gold used as a pigment. 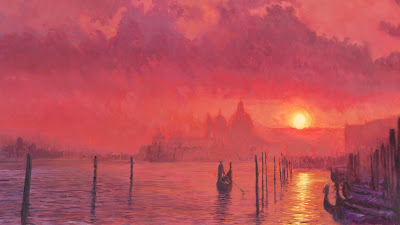 Gold-ruby, or “rubino” is a devilishly difficult color to produce in glass and was not reliably duplicated until many years after Neri’s death, although pieces made in ancient times have been unearthed. Even though gold rubino is Neri's most well known recipe and certainly his most famous red glass, this recipe does not exist in isolation. In fact, it fits in the middle of a group of eleven recipes (120–130) devoted to transparent, or at least translucent red glass, enamel and related preparations. 120 Transparent Red in Glass. 123 To extract the Spirit of Saturn, Which Serves Many Uses in Enamels and Glasses. 124 Rosichiero to Enamel Gold. 125 Rosichiero for Gold by Another Method. 126 How to Fix Sulfur for the Above Described Work. 127 A Glass as Red as Blood, Which Can Serve as Rosichiero. 128 A Proven Way to Make Rosichiero. 130 The Way to Fix Sulfur for Rosichiero to Enamel Gold. A particular shade that was popular at the time was known in Italian as "rosichiero." Our glassmaker presents four different recipes and two more on “fixing” sulfur, which some of the preparations require. 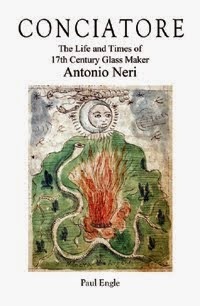 Most dictionaries cite Neri as the first to use of the word 'rosichiero' in print, but we know it was a common term of art among glassmakers much earlier. The French equivalent is "rouge clair." The Spanish edition of L'Arte Vetraria notes that in that language the term is “rosicler,” which is still used today to describe the intense rosy twilight color of a nice sunset. [A]dd this calx little by little, ½ oz at a time, let it incorporate, and watch for when the glass becomes an ash gray color, at which point it will be good. Do not add too much calx because if you overload it, the glass will become white in color, which is not good.When it turns the said gray color, do not add more calx but leave it to clarify. Then have 2 oz fine minium [red lead oxide], add this to the glass, and let it incorporate well, and clarify. When it clarifies well, throw into water, return it to the crucible and leave it for 8 hours [in the furnace]. Have ½ oz of calcined copper, that is to say red copper and ½ oz of raw white [wine] tartar. Throw these materials in, and stir them well. Now add a dram of hematite, which the sword makers use for burnishing, and 1 dram of fixed sulfur. Stir and incorporate these powders, and watch. If it is over-colored, give it a little manganese to dilute it. If it is clear of color, add more of the fixed sulfur, hematite, a little red copper and a little white wine tartar at your discretion so it becomes the desired color. None of these ingredients excepting copper is common in color glass production today; in fact, sulfur is usually considered an undesirable contaminant. Hematite is a naturally occurring mineral form of iron oxide. It is so named because if abraded in water it tints the water red, appearing to bleed. Hematite is not currently used as a red pigment in glass, but it is commonly used in some pottery glazes. From a chemistry standpoint, a good guess is that sulfur added to the glass would react with the copper and iron to produce various sulfide compounds. How those compounds affect the color and texture of the glass is an open question. Here is where we get into uncharted territory; four hundred years after Neri’s book was first published, predicting colors based on chemistry is no easier for us than it was for him. The science of color in general remains a difficult nut to crack. However, the fact that there is still much that we do not understand does not prevent us from enjoying the brilliant reds inspired by a good sunset. * For the technically minded, the University of Oslo has a wonderful presentation on the state of color physics. For the non-technical, take a look – a series of fascinating images that spans the sense of sight and beyond. There is a link address in the "picture credits" for this post. ** This post first appeared here on 24 April 2014.